So I was headed to The Rocky Horror Show, the theatrical production at Westwego Theater on Halloween night. I knew I couldn't wear my troll wig again because it would block the person sitting behind me's view. 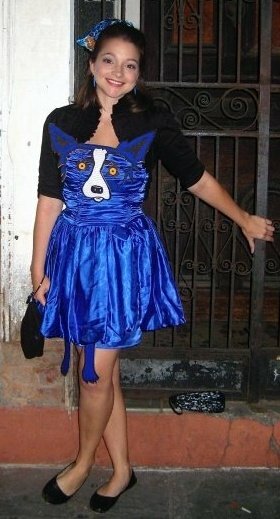 So about noon on Halloween day I started crafting this Blue Dog Dress. I already had the dress from a vintage shop. 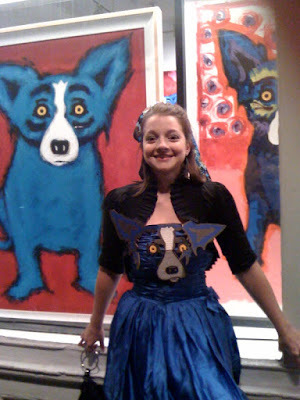 So I drew, cut and painted on cardboard the blue dog face and feet. It has been a rousing success. I'm taking orders for handmade costumes for next year so get your order in now! great costume ! hope you had a happy halloween! can't believe you got that dress from a vintage shop!! nice purchase!